Negative assumptions must be minimised at every opportunity whenever possible online. We build business and brand trust by being visible and stepping out. 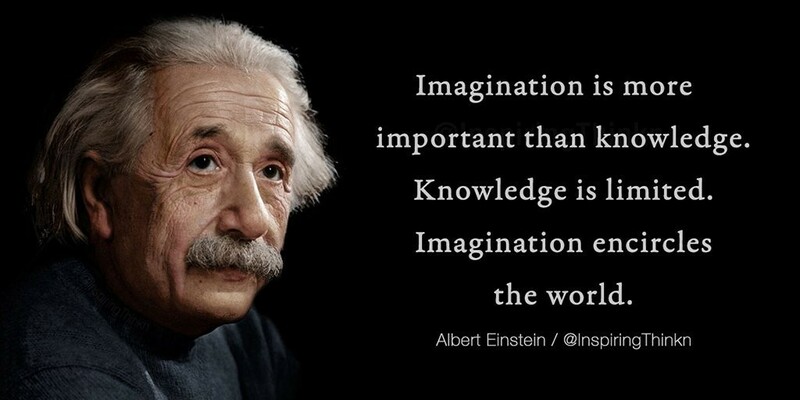 Albert Einstein famously quoted that “Imagination is more important than knowledge”. Indeed imagination is a glorious attribute that in its positive form is the fuel of childhood wonderment, human and business creativity. Imagination is defined “the part of the mind that imagines things, forms new ideas, concepts or images of external objects not present to the senses”. The essence of imagination sits in a trilogy of inventiveness, initiative and resourcefulness. The transformation of a child’s shabby stuffed toy into a beautiful princess saving the world, visualising worn Lego pieces as a space rocket or play-acting wizards with super magic powers is imagination in splendiferous action. Similarly in business, imagination is the fuel that burns creative fires, It’s the impetus of dazzling marketing ideas that build brands, rouses pathways to solve complex problems, ignites commercial artistry, entrepreneurial fire and creates products that have changed the world in ways once unbelievable. We bear witness to the positive manifestation of imagination in breathtaking form all around us. But there is a flip side too. Like all behaviours there is a time and place. If our imagination is running wild in the wrong place, fog and negative assumptions can fly high. This often occurs where there is minimal evidence or information provided. A blank canvas without detail can bubble up a sea of divergent conclusions and hypotheses. And these may or may not be correct ones. In business the issue of trust and transparency is fundamental for growth and client acquisition. And in the personal arena such as online dating, trust is crucial. Yet in both situations many hide their identify touting many excuses leaving a blank canvas to conjure up negative theories. There are countless examples from dating sites of people who didn’t have photos or important information. The upshot often was they were married, had been incarcerated or had some other untoward motive. Likewise in the business sector, there are many examples of owners going to considerable lengths to ensure they didn’t have a digital footprint of any kind. And there are many who have purposely construed conflicting information to take the scent off joining any dots. If you have ever fallen prey to such shenanigans you will have built a finely tuned nose to detect any future concerns. Establishing business trust ASAP cannot be underestimated. With Google, social media, LinkedIn and websites, all relevant research is at our fingertips. Potential, clients, suppliers and staff are checking before, during and after contact. Many professional sectors are wading through significant PR and damage control with many buckling a spotlight of suspicion (ie marketing and digital services). The Small Business Ombudsman Kate Carnell recently shone a light on the dodgy practices of some within the SEO sector and there is no need to further extrapolate on the franchise or financial fields. Roy Morgan regularly publishes their research findings of professions trust rankings where several commercial service sectors are given a shaking. Every sector has both brilliant and appalling operators. Adverse perceptions can slide the gamut of questioning fraud, credentials, integrity or of having 5 heads (ok that is a little jest there). In today’s market businesses cannot risk sprouting any seed of doubt. So it’s imperative that every business minimise the potential for imaginations to run off the tracks. It’s also a excellent opportunity to showcase great personal brands as a standout in sectors suffering a poor PR rap. Yet I am constantly dismayed at how many websites there are without photo visibility or information on owners and/or directors. A lack of photos, names and personal background information is a real barrier to building confidence. And it’s staggering how many SMEs, solo operators don’t even have a direct name to contact just a phone number. We simply cannot trust who we cannot see. Business owners must stop hiding to build greater trust. My mobile doesn’t work well in my area (yeah right ha). I went to do it, but…………. many an excuse here. Service businesses just cannot hide behind a logo or their company brand. People buy from people and personal brands is at the epicentre. Any notion that a business brand is all that is required to inspire enquiry and convert is unwise at best, ludicrous at worst. The brand promise is congruent across both the business and personal. Whatever is authentic and true for you is the image and information that needs to be shared transparently on all your public digital assets. And team (2+) photographs build a real platform of attraction for staff, suppliers and prospects. Suffice to say that when people check out a website or social media profile resulting in zero or minimal personal information imaginations may conjure up many and varied things. And whilst it is true that not everyone cares about seeing photos, mobile numbers or background information, the vast majority absolutely do. So unless you are part of the ‘mob’, are fraudulent, just released from jail, have multiple spouses (none of which are aware of your polygamous life) or have a head that would melt Google and metatags, ALWAYS put your photos, background and contact numbers up on your website and social media assets. And even if you tick the aforementioned ah, still show up and step out anyway. There is always someone for everyone’s imagination and your vibe will attract your commercial tribe at any rate. I’m off to fight the good princess fight with a Lego space rocket. Oh and I did meet my current husband via online dating site. That’s another story for another time. But he did have a great smile and genuine information.